Can this measure radiation in ocean fish? This is a complex question. The GCA-06 Series can detect alpha, beta, x-ray and gamma radiation. Checking fish or food for radioactive contamination is a little difficult and Geiger counters, (from us or any other manufacturer) is not the ideal instrument to do so, here's why. 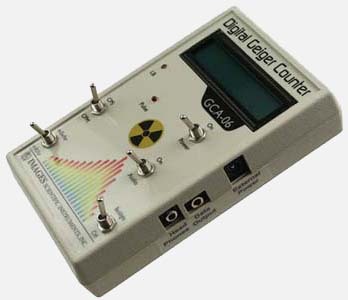 The GCA-06 Series Geiger counter can detect alpha radiation. However if the fish (or food) being tested has a alpha radiation emitter internally, the food itself will block the alpha radiation and stop it from being detected. If the alpha radiation contamination is on the surface of the fish (unlikely), it can be detected. Similarly, if the fish has a beta radiation contamination internally, let's say a SR-90 contamination, the water in the flesh of the fish will effectively block the beta radiation from being detected. Again if the beta contamination is on the surface of the fish (unlikely), it can be detected. With gamma radiation the situation changes. Gamma radiation can penetrate the flesh of the fish to be detected. The problem arises is that low level contamination gamma radiation from let's say a CS-137 contamination will be indistinguishable from normal background radiation. So to test for this contamination , one method a laboratory may perform is a gamma spectroscopy (scintillation detector) to determine the source of the radiation. In the case of testing for alpha and beta radiation mentioned before, a lab might incinerate the food or fish in question down to ash. Without the water blocking radiation it becomes easier to test the material for beta and alpha contamination. On the Images website we have a number of nuclear experiments and articles. We have an article on testing food for radioactive contamination that goes into greater detail than I can here. Is the end of the wand sensitive to radiation? The wand has an open end that exposes the mica window of the GM tube for the detection of alpha particles. In the photograph the wand has a plastic end cap on it that I recommend you keep on unless you are specifically trying to detect alpha particles. The mica window of the GM tube is thin and easily damaged. Can I log data outside of a ct scanner or x-ray installation using the software, and is the software included with the unit? The GCA-06 Series is sensitive to x-ray radiation, so you can detect and log x-ray radiation. There is free Geiger graphing software available on the Images Co website. Geiger Counter Graphing Software for PC with USB to 3.5 mm TTL cable for GCA-07, GCA-06 and GCA-03 series of Digital Geiger Counters and other compatible Geiger counters with a TTL serial data output. Keep in mind the GCA-06 Series is calibrated using a CS-137, so the best accuracy is obtained when detecting and measuring radiation from that radiation source. Difference between gca-07w and gca-03w, or gca-06w? Does this sensor measure and detect alpha, beta, and gamma radiation? The CT scanner uses x-rays which are detectable by the GCA-03 Series. If the scanner is leaking x-radiation you ought to be able to detect the leakage using the GCA-06 Series. Where (what country) is it manufactured in? The GCA-06 Series is assembled and built in the United States. Since it says it is NRC Certification ready, doe that mean I have to get it certified after i purchase it or does it come with the certifacation? Yes, you must have it NRC certified after you have purchased the GCA-06 Series. NRC certification cost $125.00 plus shipping and takes approximately two-three weeks to ship to laboratory and have it returned certified. NRC certification is good for one year. For this detector, what is the conversion factor between mr/hr and cpm? The cpm to mr/hr is not a straight line graph. The graph of the response line for cpm to mr/hr is logarithmic. In the beginning it is 0.05 mr/hr per 1 cps or 0.0008 mr/hr per 1 cpm. This approximation changes as the radiation field increases. Does it have an alarm? if so between what levels can it be set? The GCA-06 Series does not have a built in alarm. However the full version of the PC software for the GCA-06 Series does. This alarm may be used when using the PC software to monitor radiation levels. The alarm may be set using either CPS value or a mR/hr value. Does it have a test strip attached? I'm not sure what you mean by test strip. If you mean does it have a calibration certificate, yes, it has a factory calibration certificate. If you are asking if it has a radioactive check source, then the answer is no. We sell uranium ore that you can use as a check source. Which particles can it detect and measure? Alpha particles...2 protons and 2 neutrons bound together. Beta particles...energetic electrons and positrons. Does the gca-06 use a "pancake" style geiger-mueller tube or a standard style tube? Does the GCA-06 Series have a scintillation detector option? No there is no scintillator detector option for the GCA-06 Series. "Measures alpha particles above background radiation" - background radiation changes based on rocks and equipment. How do you allow for that? First alpha particles only travel a few inches in open air. So unless you are measuring a radioactive source within a few inches of the sensor, you are not detecting alpha radiation. The uranium ore samples we sell emit a high percentage of alpha particles that may be blocked with a sheet of paper. The second question I think you are asking is how to separate out background radiation from a radiation reading. What I would do is take an hour's worth (60) of one minute readings. This is the CPM (counts per minute) mode on the GCA-06 Series. With this data collected. I would add the 60 readings together. I would then take that total and divide it by 60 to get an average CPM reading. Next I would look through the 60 CPM readings and mark down the highest count CPM reading, and the lowest count CPM reading. Those two CPM numbers are your Max and Min. With this information you take a radiation reading off an object. You can first determine if the radiation reading(s) are greater than you MAX CPM number. If the readings are consistently greater, you can make a logical assumption that there is an increase in radiation due to the object you are testing. In some cases you would also subtract the average CPM number from your reading to see what the increase in radiation is on average. Much depends upon what you are actually attempting to do and read. You could also average a much larger number than 60 samples to obtain the average CPM, Min CPM and Max CPM. In general the greater the number of samples the greater the level of confidence. Can the wand be purchased separately for a replacement if the original is somehow broken? Yes, you can purchase a replacement wand from the manufacturer. However, each wand and Geiger counter are tuned together to obtain a high degree of accuracy. By just replacing the wand you will get a functional Geiger Counter. To obtain the accuracy of the instrument you will need to return the unit to Images SI Inc., and have the wand factory calibrated to the instrument. Factory calibrations are $35.00. Would this meter be good for emergency responders, emergency preparedness and monitoring radiation near nuclear sites. Are their warranties available ? This Geiger counter may be used in those applications. The advantages of our GCA-06 Series is that it may be NRC certified to its accuracy. While many Geiger counter manufacturers claim high accuracy for their Geiger counter, it simply is not true. Fortunately the United States Government has a license standard for Geiger Counter accuracy. This is a Nuclear Regulatory Commission (NRC) certification for accuracy. NRC certification can only be performed by a nuclear laboratory licensed by the United States Government to perform such certifications. Without this certification, you can not be sure of any claim that a Geiger Counter accuracy is valid. The Geiger Counter itself has a one-year warranty for manufacturing defects. The GM tube in the wand however is not covered by the warranty. The mica window on the front of the GM tube that allows the Geiger Counter to detect alpha radiation is very delicate and if mishandled will break. What is the operating range in microseiverts/hr and mR/hr? and operating temperatures? The operating temperature range is approximately 0 - 140 degrees Fahrenheit. Is there a documented data format that could be used to pull the data into another application (via USB, but without the manufacturer's software)? Yes. The serial CPS data is sent out, once every second, as a two byte number (most significant byte first) with the following specifications: 9600 Baud, Inverted, 8 data bits, no parity and one stop bit. Count Per Second (CPS) = (High Byte * 256) + Low Byte. The raw serial signal from the Geiger counter is TTL logic +5V and 0V. Will this detect depleted uranium? Yes. Deplete Uranium (DU) is slightly radioactive and according to the spec sheets I've read emit mostly alpha particles. The GCA-06 Series can detect radioactivity over background radiation. Although DU is not available to either test or make measurements. At what level does it saturate and what happens when it does? The independent laboratory we use for testing and calibrating our Geiger Counter can only test up to 1000 mr/hr or 1 RAD or radiation. That is the limit this lab can test and at this radiation level the GCA-06 Series does not saturate. I do not know how much greater a radiation level the GCA-06 Series can detect before going into saturation. Does it come with everything in the last picture? No. You are purchasing a single Geiger counter with wand, no accessories are included. It comes with base unit, wand, connecting wire, instruction manual, CD and ethernet cable. I can not remember if it comes with batteries and recharger or if we put in off the shelf batteries. Either way I had it up and running in 15 minutes. The only draw back to it is that if you want a counts per minute, you have to wait a full minute. More fancy units that a scrap yard would use to scan shipment can sample in a few seconds and scale to full minute. But for a few hundred dollars, it did what we needed it to do. Is the software MAC compatible? Yes, I used it to monitor the air for cs-137 overnight from the window silt. I worked very well. Is certification and calibration the same thing? Sort of. If a device is calibrated by a certified technician it is certified for commercial use. The NRC requires that our Geiger counters be certified yearly by a company that is licensed to do so, at that time accuracy and if needed calibration is done. http://www.imagesco.com/geiger/certification.html This website has a good explantation.